I am a reading specialist, so it makes sense that I would love books about books and reading. I especially love books about books when they show readers the importance and beauty of reading. This is one of those books. Isaac doesn't have many interests and his parents can't even get him interested in books when they bring him to the New York Public Library. On the way home from the library, they stop at a shop and the shopkeeper tells Isaac about The Book of Gold. This is a special book, waiting to be discovered somewhere in the world, that when opened will turn into gold. Isaac searches and searches for the book, in hopes that he will find the gold, until he is an old man. As he searches and opens each book he gets more curious and he realizes that he has found something special within the pages of the books he's read after all. As Isaac is transformed from a nonreader into a reader, this book shows all that can be discovered within books. Isaac reflects on his life and realizes it's been filled with learning and wonder because of the books he has read. The illustrations in this book are detailed and there are pages that shine like gold. As a reading teacher I want my students to improve upon their reading skills, but I also want to nurture their love of reading. My hope is that they see that books can offer them gold. 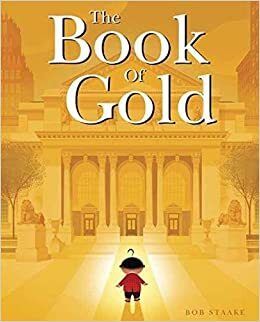 The message within The Book of Gold is one I want my students to learn.